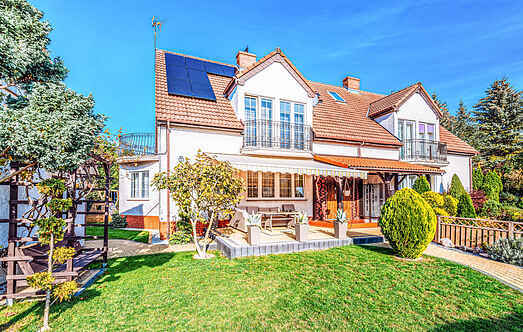 Choose from a selection of 5 holiday rentals in Korzystno. Use the search form to the left to filter the results and pick your choice of self catering accommodation in Korzystno. We have a good selection of holiday apartments in Korzystno perfect for family, single, romantic and group holidays. You may prefer to take a look at our listed holiday villas in Korzystno or holiday apartments in Korzystno. Find your holiday homes by a specific type using the property type drop down in the filter. Filter the holiday homes in Korzystno by a specific area using the area list above. This pleasantly furnished double house is located in Grzybowo, next to the city Kołobrzeg. The house consists of three floors. 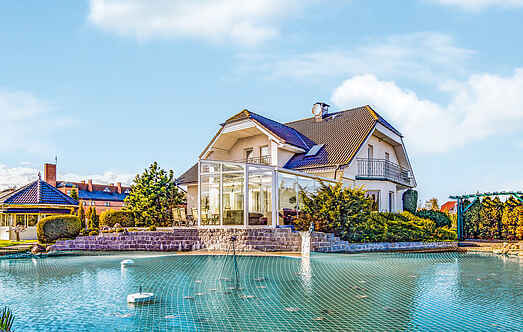 This exclusive and very spacious house with a modern and high quality facility is situated on a generous plot, beautifully located near Kolberg and the Pomeranian Baltic coast. This typical holiday home is very cosily furnished. All rooms are bright and attractive. In the garden, a barbecue and an outdoor swimming pool are available. This cosy cottage is situated on a shared property with PPO140. It is furnished with new furniture and offers enough space for ten people. This tastefully furnished holiday apartment with beautiful furniture awaits you on a shared plot with PPO141. A beautiful and well-kept garden is available for shared use.